For those of us that want to attract butterflies and moths to our yards, we must focus on the four things they will need; Sun, Water, Shelter and Food. A butterfly garden should have plenty of sun (at least 6 hours a day) to attract our winged friends so, a sunny site is a must. They need the heat from the sun and plenty of good basking spots in which to warm up before they fly. The plants in your butterfly garden also need the sun in order to grow! 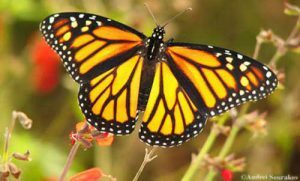 Provide both nectar and larval plants in your butterfly garden. To initially attract them to your yard you must have plenty of nectar plants and a diverse array too; different colors, shapes and sizes to meet all their needs. Providing a number of different host plants will also ensure the butterflies and moths will stick around and lay their eggs for the caterpillars to eat. So both are important to consider when planting your garden. Also providing a water source for them to ‘puddle’ is important. This should consist of water, small rocks and dirt. This way they will land on the rock and take a drink while receiving the important nutrients needed from the ‘mud puddle’. Providing shelter is important too, this will protect them from predators, poor weather and a spot to roost/sleep. UF/IFAS St. Lucie County Education Outreach Coordinator, Master Gardener Program.